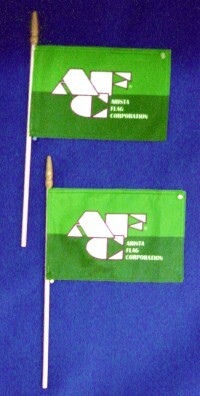 including standard parade size (12" x 18"). Outgoing Set: Numbers 1-9, red with white numerals. Incoming Set: Numbers 10-18, white with red numerals. Note: The colors listed here are stock color combinations. Standard sets are manufactured in sewn & appliquéd nylon in single-side construction only, and include heading and grommets with cable ties. 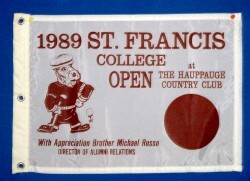 Refer to diagram box below for further illustration of standard golf flags. 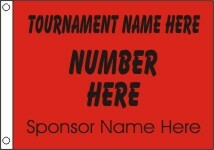 Flags can be customized with tournament, location, or company names. Best manufactured using the dye-sublimation method. 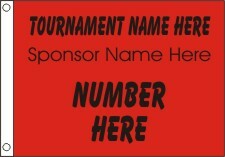 A typical example of this style is a flag that has the tournament name on top, the number in the center, and the individual company name on the bottom made as a single-side only print. 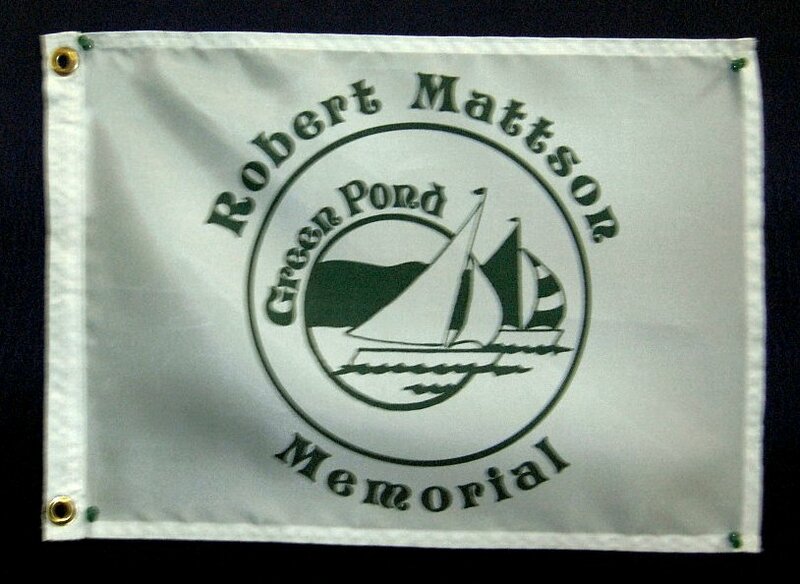 Flags include heading and grommets or plastic/vinyl tube header. not customized from $18.00 to $30.00 each depending on quantity. customized from $24.00 to $38.00 each depending on quantity. Additional cost for vinyl/plastic tube header. Refer to diagram box below for further illustration of customized printed golf flags. Refer to photos section for examples of printed customization. In the following diagram box, we illustrate the appearance of an Outgoing and Incoming Golf Flag Set. These items can be purchased at our e-Store. Golf Incoming Flag Set (9 flags) Size 14" x 20" White w/ Red letter & grommets. Golf Outgoing Flag Set (9 flags) Size 14" x 20" Red w/White letters & grommets. Golf Plain Flag Set (9 flags) Size 14" x 20" Solid Red w/ grommets. 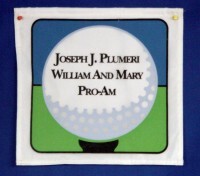 Golf Direction Flags Size 14" x 18" Styles 1-3 w/grommets. Nineteenth Hole Size 12" x 18" w/grommets. Worlds Greatest Golfer Size 12" x 18" w/grommets. 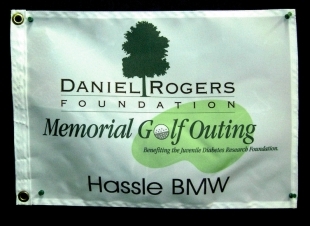 Individual Solid Color Nylon Golf Flags Size 14" x 20" w/ vinyl/plastic tube header. 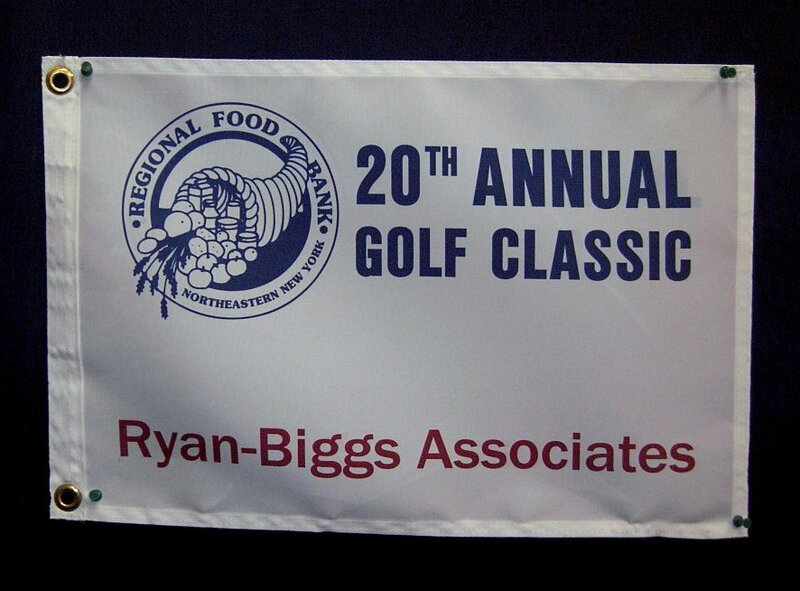 Individual Solid Color Nylon Golf Flags Size 14" x 20" w/ heading and grommets. 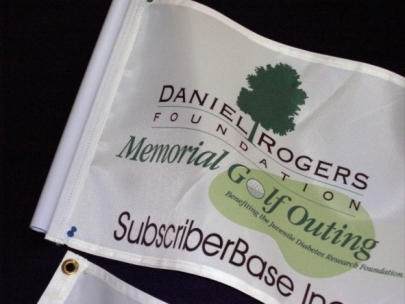 Dye-sublimation is the method we recommend for Customized Golf Flags. Factors that influence cost: A) white background or printed color background; B) quantity. we can print multiple colors without increasing cost. not customized from $18.00 to $36.00 each depending on quantity. customized from $21.00 to $44.00 each depending on quantity. 7' Fiberglass Golf Poles are now available in white or yellow. 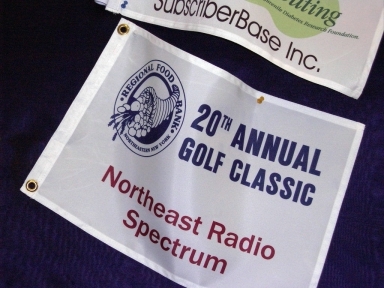 Fiberglass Golf Poles can be used with custom vinyl/plastic swivel mount or cable ties when mounting golf flags. Photograph to left shows white and yellow 7' golf poles with optional vinyl/plastic tube header. Right photograph shows vinyl/plastic header tube sewn to flag. 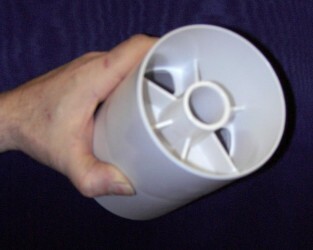 The header tube slides over the top of the pole and is secured with a screw cap. 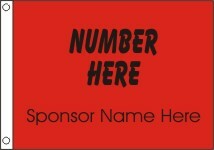 Available in nylon for screen printing or polyester for dye-sublimation. 14" x 20" blank white flags for do-it-yourself printing. Sold in quantities of 6, 18, 24, 30, 36, and 50 flags. 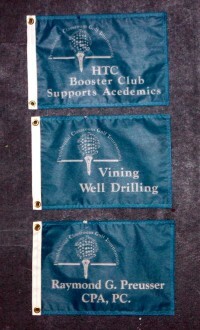 Flags are available with heading and grommets or vinyl header tubes. We will supply additional scrap material for test printing, if requested.